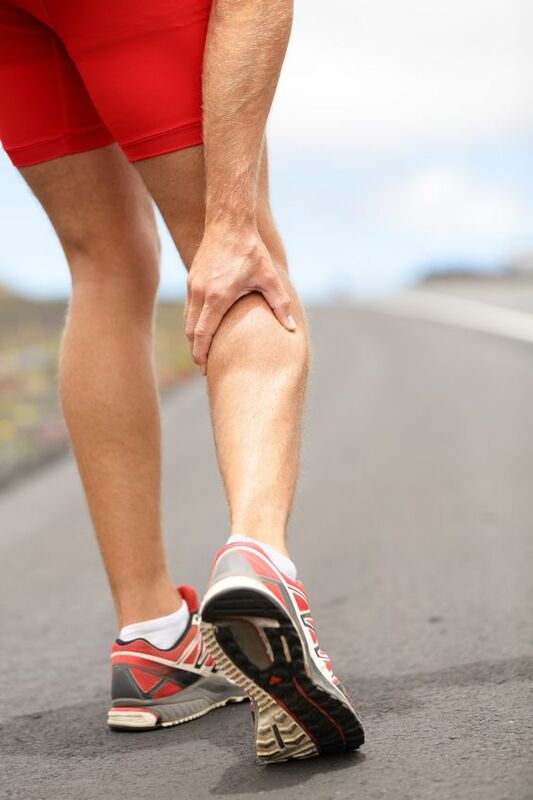 Muscle cramps can occur in the entire muscle, part of a muscle or an entire muscle group. Fatigue and dehydration are two primary causes of cramps during activity performed in a hot and humid environment. One liter of water weighs 2.25 lbs. Someone can lose almost 2 liters of water per hour in hot/humid weather during intense activity. Sports drinks should contain no more than 10% carbohydrate. Your Physical Therapist can help you with an exercise routine that will help you avoid having muscle cramps occur. One minute you’re relaxing and the next minute you’re experiencing muscle cramps. Suddenly your leg tightens and locks in a spasm, and you experience shooting pain. Muscle cramps can surprise us in the middle of sleep, when we’re actively exercising and even when we’re just sitting. They can occur any time and in every type of muscle tissue. What are muscle cramps and what can we do about them? For now, let’s focus on skeletal muscles since these muscles are under our control. Skeletal muscle tissue is very elastic in nature. The muscle cells are capable of contracting and relaxing and are present to produce movement of our body both voluntary movement and reflexive or involuntary movement. A muscle cramp is an intense, involuntary contraction that causes pain. There might be a visible “lump” within the involved muscle. While almost everyone has experienced a muscle cramp, the causes can be varied and many times medical professionals do not know the exact cause. Common causes of muscle cramps include muscular fatigue, dehydration, low-level electrolytes, over-activity of a nerve, injury, poor circulation and low levels of minerals and vitamins. Muscle Fatigue – The fatigued muscle may cramp as a protective response to avoid a possible injury that could occur if it were to continue functioning at full capacity. Dehydration – When the body gets dehydrated, the fluid level drops in muscle cells, which can result in cramping. Waiting for the thirst sensation to occur can be too late. Exercising or working in a hot and humid climate can make someone more prone to dehydration cramps. Electrolyte Depletion – Poor diet and excessive sweating can lead to depleted levels of sodium and potassium electrolytes. These electrolytes are needed for normal contraction to occur. They are critical in the transmission of a neural signal that enables the muscle to function properly. Too much or too little of these can make the muscle cramp. Injury – Muscles will contract violently and cramp if there is severe injury to a body part. Seeking to avoid further damage, the body’s protective mechanism responds by preventing further movement to the injury site. Blood Flow – If a body part does not get adequate blood flow (claudication) during activity muscle cramps will occur due to a build-up of metabolic by-product. The acid/base concentration within the muscle cell changes and causes an inefficient contract/relax cycle within the muscle. The muscle contracts and will not relax. Poor Mineral Levels – Calcium and Magnesium are necessary minerals to make muscle contraction efficient. If their levels are abnormal, cramping can be present at any time. Many times, a supplement of one or both of these is needed to achieve the proper level within the blood. Vitamin D is essential for the uptake of Calcium to occur, therefore if there is not an adequate supply of vitamin D in the blood stream the available calcium may not be utilized and muscle cramping can occur. There are practical steps we can take to help prevent muscle cramps from happening. Proper strength training – Weak muscles are more susceptible to cramps because they fatigue quickly when used. Stretching – Tight muscles and inflexible joints can force the muscles to “work” harder to and use more energy to get the movement to occur. Consequently, the muscle fatigues more quickly and can cramp. Diet and Supplements – Eating a well-balanced diet ensures that the proper electrolytes, vitamins and minerals are available for the body to use and metabolize during activity. These are needed for normal muscle function and supplements might have to be used if the levels are found to be lower than normal when a blood test is performed. Pre-activity Hydration – Drinking plenty of water is always important. Before exercise or activity it is especially important to hydrate with water and non-sugary, non-caffeinated sports drinks. Sugar will decrease the up-take of the fluid in the gut. Caffeinated drinks need to be avoided because caffeine is a diuretic and will cause someone to urinate more often, depleting the fluid supply very quickly. Hydrating properly is critical in preventing muscle cramps especially in hot and humid weather. If a cramp occurs, respond by gentling stretching the muscle accompanied by gentle massage. The application of heat and/or ice can speed up the process of reducing the cramp intensity. Ice massage is appropriate during an athletic event or work activity that causes a cramp to occur. Many times the muscle can be stretched, iced and massaged at the same time. Cramps can occur due to prolonged positioning of body parts; therefore do not remain in one position for prolonged periods of time. Some people will benefit from the use of Quinine, which can be found in tonic water and has been shown to decrease muscle activity. Unfortunately, it has been linked to birth defects and miscarriages and is not available in pill form in the United States. Muscle cramps are very common and most of us will experience one or more at some time in our lifetime. Fortunately most of them are not serious and do not cause any harm to the muscle. Some precautions can be taken to prevent them and when done properly the frequency and intensity of the muscle cramp can be significantly decreased. Ask your doctor or Physical Therapist for some suggestions of exercises that will help you avoid the onset of a muscle cramp. Physical Therapy clinics conveniently located in Falls Church VA, Faifax VA, Herndon VA, Alexandria VA and Leesburg VA.
Are you are looking for Physical Therapy Clinic close to home or the office? If you live in Northern Virginia we have you covered! Get your "Physical Therapy in Falls Chuch VA", "Physical Therapy in Herndon VA", "Physical Therapy in Fairfax VA"! Physical Therapy in Alexandria VA or "Physical Therapy in Leesburg VA" by our experienced Physical Therapists! !